and Hello to DIET FREEDOM! I'm so pumped you're here! 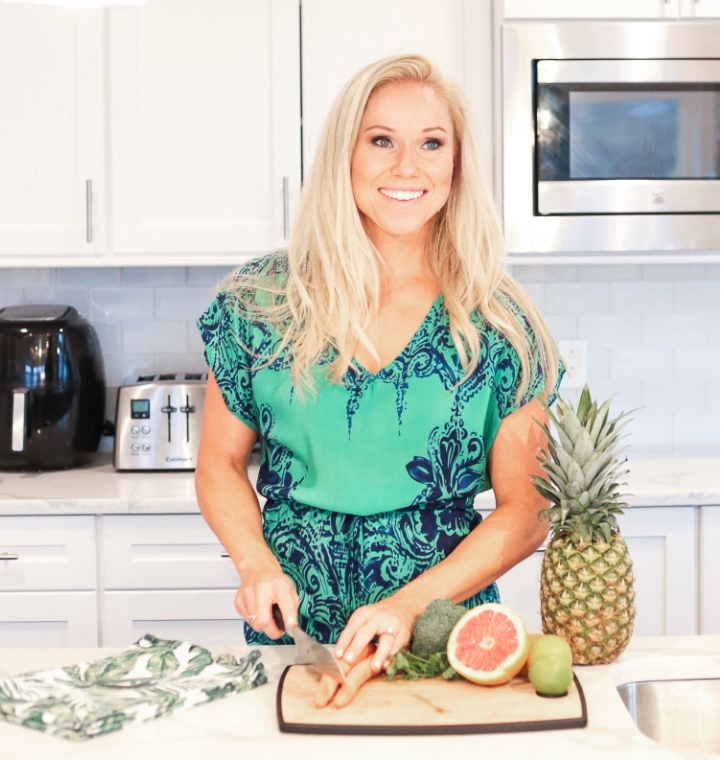 And super excited that you are ready to take your health to the next level by learning about macros and what it can do for your health, fitness, and lifestyle and how it helped me DITCH THE DIET ROLLER COASTER and start experiencing total food freedom! Ya’ll know I’m super passionate about helping women shed fat AND get rid of the all or nothing mentality, find a way of eating that fits their lifestyle, and, most importantly, get rid of the mental blocks that have been holding them back from truly making permanent lifestyle changes. Just a few short years ago I was SO restrictive during the week and felt SO guilty if I ate anything off track that I would restrict myself even more and do extra cardio the next day to try to balance it out. Yikes! This wound up getting me into a vicious cycle of restriction – binging – feeling guilty about binging – more restriction – extra cardio cycle that led me nowhere! But now, I NEVER overeat when I’m stressed or frustrated, and I NEVER go up and down the same 15-20 lbs. Restricting certain food groups doesn’t work. So what if there was a way to have your cake (and ice cream of course! ), and eat it too, literally! And I mean ACTUALLY reaching your fitness and health goals while eating what you love and feeling WOW-tastic about it…aka a HAPPIER, more CONFIDENT PERSON?! I've done it! And now I want to teach you how to as well. I've designed a FREE 5-Day Challenge just for you to learn the basics of flexible dieting and slaying the #fitlife. • You’re tired of hearing about “food freedom” and “flexible dieting” and wondering what you’re missing. • You’re tired of feeling guilty because you ate your kids leftover grilled cheese, PB&J sandwiches, cereal, etc. • You’re tired of restricting calories all week and eating the same boring diet foods, just to make it to Friday and spend the weekend eating everything in sight. • You’re tired of falling ‘off the wagon’ only to start ANOTHER new diet, with ANOTHER set of rules and restrictions. • You’re tired of navigating the soccer mom, lax mom, hockey mom life and not knowing what to eat while on the go. • You’re tired of being tired! • Learn the basics of macro tracking, how to track, and how to have greater food freedom. • Skip the salad and order a real meal when you’re out with friends and family because there are no good or bad foods anymore! • Stay true to your nutrition goals over the weekend, while still enjoying the foods you love. • Start living a balanced lifestyle without guilt or stress! • Learn how to get in a quick workout right from home with minimal equipment. • Have a community of like-minded women who support and understand your goals. Well guess what... there's a solution! The 5-Day WOW DIET FREEDOM Macros Challenge is for YOU!